What Makes a Company Best? Service: This is the first and foremost criteria that make a company best. Actually, this is the core principle to survive at the ever-changing IT industry. Without providing customer satisfactory services a company can never gain the trust that it needs to raise among thousands of IT companies in the market. People: This is the hardest area to maintain quality as it is constantly in motion and change, and this needs attention on a daily basis. A company is nothing without its employees and great employees make a company great. Purpose: All great Companies share two commons purposes: First: they all have a clearly defined purpose, a reason for being, that everyone understands and considers important. And second: to create a working environment that supports their valuable employees and rewards excellence, honesty, mutual respect, and fairness. Great Companies support a culture where people work hard to get results and where they are appreciated for their efforts because that too is the purpose of doing business. 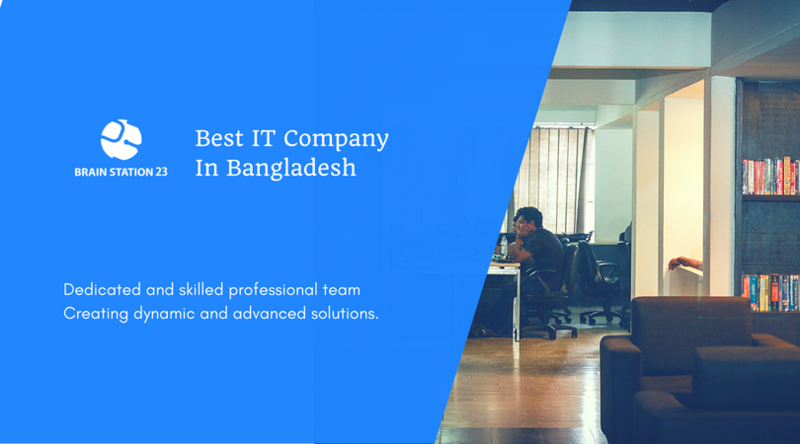 Considering all the above criterias, Brain Station 23 can be considered one of the best IT companies in Bangladesh. Brain Station 23, with it’s dedicated and skilled team of professionals has been able to create dynamic and advanced solutions and services for the clients based all over the world sharing the same purpose to be the best service providing company in Bangladesh. 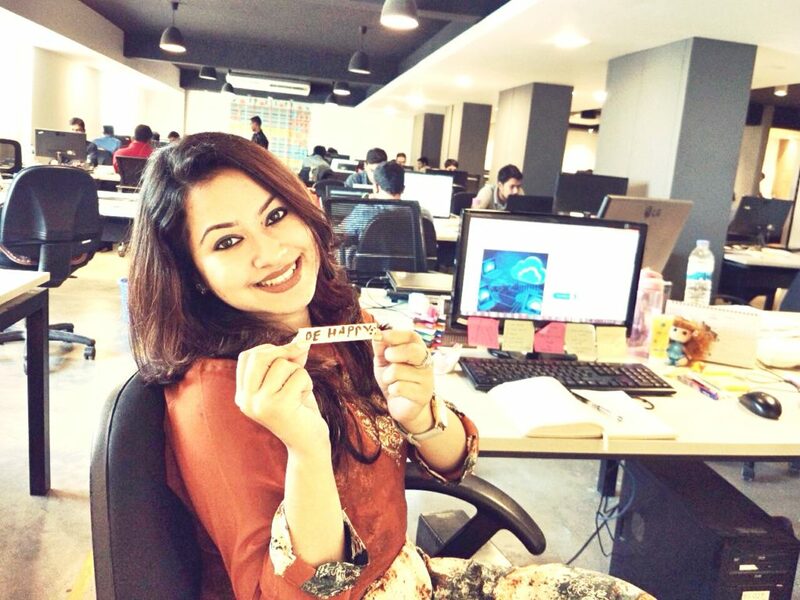 Let’s follow the rest of the blog to say with me, yes, Brain Station 23 claims true of it’s being on top of all the best IT company in Bangladesh and also well accepted in the global industry. 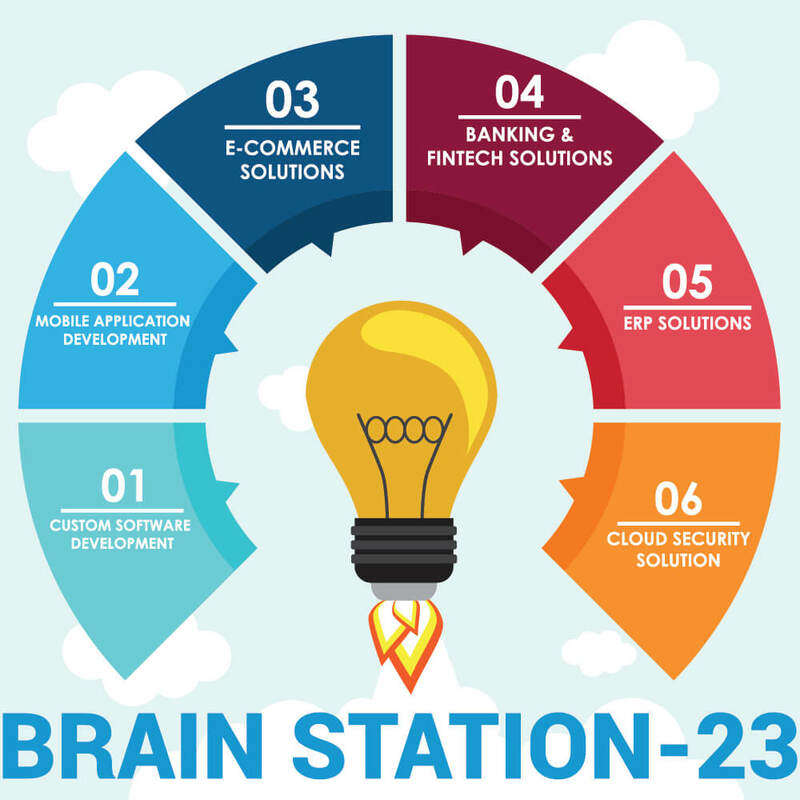 Brain Station 23 is an IT service and Software development company in Bangladesh providing bespoke solutions across the responsive Mobile app, Web application, E-commerce & Enterprise Solutions and Cloud/ SaaS-based solution. We are an ISO 9001-2008 certified company with 12+ years of domain knowledge and expertise in the IT field. Plus we have skilled and expert people of all sectors to serve the best services to our clients. To maintain this, Brain Station 23 arranges various professional certification courses to provide their employees all kind of opportunities to grow and serve the best. Brain Station 23 is not only is well-trusted among its long list of clientele, the partnership with global tech giants, but i.e. Microsoft, Amazon Web Services, Google, Adobe, nopCommerce, Odoo etc. is also equally strong. Regardless of the industry, you are affiliated with, let’s follow the most essential facts that pushing us upward among all the software development companies in the local market and global industry. We, Brain Station 23, specialize in catering to the changing dynamics of the Information Technology and software development industry. With the increase in internet penetration, growth in smartphone device market, reducing the size of devices and increase in number and types of mobile devices, we help organizations adapt to this evolving landscape. Team Brain Station 23, delivers innovative products just what your business requires. We are the leading providers of cost-effective solutions which are scalable, reliable and built on the latest technology platforms. Our unique recruitment process and agile project management practices ensure quick turnaround time. All this is supported by the state-of-art infrastructure to address client queries quickly. More than building world-class products, serving the latest technology services, cloud and security solutions, we believe in building long-term relationships. Our culture is inspired by collaboration in whatever we do. At the onset of the project, we sit down with our clients to understand their requirements and consult them on what additional needs can crop up in future. This is the essence of our Customer centric approach. Today our solutions power operations of services across critical industries such as banking-finance, retail, eCommerce, cloud and latest AR and VR solutions. We are the pioneers in providing custom software solutions across both Web & Mobile application, Internet banking solutions, AR VR solutions, Cloud, ERP, SaaS projects etc.. We follow a structured software development process in accordance with the industry best practices. This includes requirements definition, software design, coding, source code control, code reviews, software configuration management, testing, release management, and product integration. The entire process is observed & executed by our clients feedback to ensure a good fit with their requirements. Unlike any other IT companies in Bangladesh, we, Brain Station 23, make sure that our solutions meet global software development standards in addition to our clients’ requirements. Continuous process definition and implementation, audits & training ensure a bug-free solution. Our ISO 9001-2008, 27001 certifications stand testimony to our focus on delivering quality solutions to our customers. We develop mobile apps for handheld devices, such as personal digital assistants, enterprise digital assistants or mobile phones. We have built industry-specific mobile apps as per our clients need, such as- internet banking mobile app for fintech industry, AR VR mobile app for automobile industry, Online shopping mobile app for e-commerce industry, MSF mobile app for pharmaceutical industry etc. Our apps help our clients provide convenience to their customers. Special attention is paid to Mobile User Interface (UI) Design. Given the constraints such as limited attention, minimum keystrokes & task-orientation; contexts, screen, input and mobility, our talented pool of professionals ensure that our end product is more convenient and user-friendly. Our e-commerce solutions always loaded with the trendiest industry-focused features to attract customers. Our solution includes Website Builder, domain name, secure shopping cart, product catalog, payment gateway, marketing tools, reporting & analytics, and mobile-optimized store. Some of Bangladesh’s top e-commerce sites are built by Brain Station 23, such as- Othoba.com, KiKsha.com, Priyoshop.com etc. To cope up with the latest trends, we also work for cloud integration in the e-commerce businesses and also work with Machine Learning and Artificial Intelligence technology integration to e-commerce businesses. We provide a complete range of the most secure internet banking and software solutions tailored for the banking business and financial institutions. Additionally, we do use the latest state of art technology to test the scalability of our applications in the test environment to see how it performs for hundreds and thousands of users. Therefore, the apps we provide are highly configurable, both in its look and feel as well as in its functions. City touch app for city bank, AB Direct internet banking for AB Bank etc. Whether it’s service bots, Block-chain, Data Science or Business Intelligence, we are all upfront for developing the latest Fintech solutions for our customers in Brain Station 23. We Brain Station 23, being one of the leading software development company in Bangladesh, providing ERP services with the help of our most talented team of ERP experts. Stepping forward with the newest technologies, we are providing ERP solutions to our local clients since 2016. We have Odoo and SAP professionals to serve our clients all over the world which makes our portfolio weighted with global recognition. We provide CRM solution to Base Technologies, Fleet Management System for Oslobuss, Customized module specific solution to Tanin Group etc. We are one of the few vendors in Bangladesh to offer end-to-end services & solutions to the customers. From eCommerce to enterprise software development we have a strong footprint over the most competitive businesses and markets both globally and locally. And now we are receiving requests for more customized software with specific modules which has lead us to start working on SaaS models. We develop platform-independent AR & VR applications cut for individual operating industry. Our solutions are based on realistic business analysis to reinvent your company showcase and enhance customer experience to meet their business challenges, We build native end-to-end solutions for our customers market requirements. We design leading-edge mobile applications for real-estates, furniture companies, automobile industries and so on. Creative 3D graphic designer, effective storyteller and experienced cross-platform developers are our prime assets to bring you the world-class content for your AR & VR needs. Brain Station-23 always focuses on Customer Satisfaction. We are Standard Consulting Partner of Amazon Web Services (AWS) Team, Microsoft Azure Cloud Partner and Google Cloud Partner. We provide a better and optimize solution for your business infrastructure and help you to migrate your whole environment to your required cloud platform. Our Certified cloud engineers are always at your service for consultancy and maintenance of your cloud resources. We offer cloud services to enable faster disaster recovery of critical IT systems without incurring the infrastructure expense for a secondary physical site. We follow many popular disaster recovery (DR) architectures for highest flexibility. However, we always try to deliver secure, salable, and durable storage for businesses looking to achieve efficiency and scalability within their backup and recovery environments, without the need for an on-premises infrastructure. We provide cloud solution to Banks, Telcos, Ecommerces, Enterprises etc. For example, we are serving City Bank, Ajkerdeal, Ecstasy, Grameenphone, Robi and many more local and global companies as per their need. If asked of the experience of working, most of the Brain Station 23 employees will respond with the four words: “I love my Job”. We always try and we made it possible because we care for our employees as much as we care for the customers and our company. No company can claim 100 percent employee satisfaction. As there are always going to be things to gripe about, People are very enthusiastic here as they also like to work with challenging new technologies and industries best practices that brain station follows heart and soul. We treat our employees fairly with decent payment and give them good benefits, including not only decent health care but other even almost all needed essentials, like paid leaves, daily snacks, mid-day meals. And in return, they use layoffs as a last resort. We help employees with their careers and understand that not all careers are built the same. They have strong training programs, workshops, have active, well-thought-out platforms for mentoring and provide pathways for non-traditional career paths. Just for example, right before heading to write this blog, I myself, working in the Marketing department as a content writer, took the thought-provoking KBshare session on Digital Marketing. So you get the opportunity to grow as a person in Brain Station 23. Brain Station 23 understands that our people have lives outside of work and that these lives might sometimes impinge on (or even take over) their time and attention. We realize that allowing for some work-life give and take means not only that they won’t waste time and money on unnecessary turnover, but that they’ll build loyalty and commitment. They know it’s give and take, not give or take. We experience fun, humor, and relaxation not as the enemies of hard work, but as its allies. Even our developers take part in local sports representing the company brand. One of our happy employees! Brain Station 23 has a purpose — a mission — that everyone understands. Even better, every employee can tell you the role he or she plays in achieving that purpose. It’s not easy to achieve all of these being a tech company based on a developing country like Bangladesh. Yet we do what we can do as best IT company in Bangladesh. But some companies have come admirably close, and others are to be applauded for trying. In a nutshell, we are a one-stop solution for both IT needs and career development. Contact us to create the difference you want in your business, profession, and life!